The conversation is getting old. You know, the one about how Apple isn’t innovating with new hardware because the future of its business is in services and streaming video and this new Apple credit card that blah blah blah. But a lot of people point out one exception, one new Apple product that feels truly revolutionary and very good: AirPods. The second generation AirPods have arrived, and I can confidently say that they are very good. As an upgrade, I guess they’re fine. They’re not revolutionary, and that’s okay. 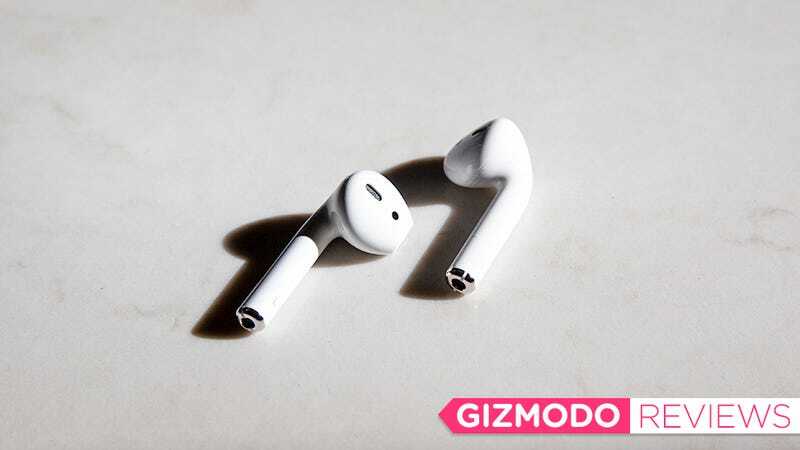 Let me be clear: I don’t have many bad things to say about the second generation AirPods. Most of the good things I have to say about them are also true for the first generation AirPods, which first shipped in December 2016. To the naked eye, the new AirPods are identical to the original ones, except they’re functionally better than the first generation AirPods, thanks to a new Apple-made H1 wireless chip. You also have the option to buy a wireless charging case which simply enables you to charge the case and AirPods wirelessly. The second generation AirPods cost $160 with a regular case and $200 with a wireless charging case. (The wireless charging case can also be purchased separately for $80 and works with both generations of AirPods.) You can currently buy brand new first generation AirPods on Amazon for a little less than $150. All that pricing information is important because it’s a clear indication that Apple is selling a second gen product that’s extremely similar to the first gen product. The new ones are better, and I’ll get into that in a minute. You do not need to spend the full $200 to get the best of the new features, though. To be totally frank, none of the new features really justify upgrading if you have a perfectly good set of first generation AirPods—unless you absolutely love talking to Siri. There’s a technical reason for these improvements. Apple’s H1 supports Bluetooth 5, instead of the older Bluetooth 4.2 that’s in the W1 chip from the first gen AirPods. The new Bluetooth standard uses less power and offers faster data transfers. Apple says all of this adds up to 50 percent more talk time (three hours in the new AirPods versus two hours in the old ones), an extra hour of listening time (five hours versus four hours), and faster switching between devices (twice as fast). I’m guessing that the faster data transfer speeds enable that new speech-activated Siri functionality, too. The first generation AirPods (right) appear to have a stainless steel hinge, while the second generation AirPods (left) appear to have an aluminum hinge. Here’s a first generation AirPod (left) next to a second generation AirPod (right). Can you spot the difference? This is a trick question. Battery life is a slightly different beast. I ran a listen-time test with the new AirPods, and the buds lived up to their five-hour promise. 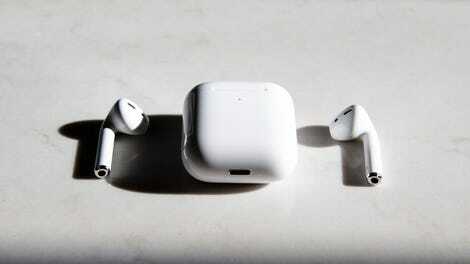 A talk-time test also showed that the new AirPods do indeed last 50 percent longer than the previous generation. They lasted over three hours in my test, which involved a very long phone call without moving around or doing anything else. And these improved results aren’t because Apple stuffed bigger batteries in the things. An iFixit teardown of the new AirPods shows that the second generation’s battery hardware is exactly the same as the first’s, which means any battery life improvements are thanks to the new H1 chip—namely, its Bluetooth 5 support. The new H1 chip is also supposed to improve microphone performance, especially in noisy or windy areas. I’ll just be blunt at this point. The new AirPods passed all of our tests. They do offer better battery life. They do switch between devices about twice as fast as the old AirPods. They do give you the ability to beckon Siri by saying “Hey Siri,” without tapping on anything. Also, the wireless charging case does charge wirelessly, which is super convenient if you’re someone with a wireless charging pad. The new AirPods are better than the old AirPods, and if you don’t own old AirPods, it’s probably worth spending the same retail price ($160) on them that you would’ve spent on the old AirPods a couple of weeks ago. The only other difference on the wireless case is that the battery indicator light has been moved from inside the case to the front of the case, so you can see when they’re charging while sitting on a pad. If you don’t own wireless earbuds at all, it’s definitely worth shopping around. Again, the $150 Jabra Elite 65t and the $130 Samsung Galaxy Buds are great AirPods alternatives, especially if you’re not committed to living in the Apple ecosystem. If you’re committed to being an Apple fan, though, the AirPods are better than ever. They’re a little bit behind their time in terms of being the very best wireless earbuds and being totally universal. But hey, that’s fine. Correction: A previous version of this review mentioned AirPower. Apple killed that project on Friday, so we removed to mention of it found above to avoid incorrectly getting hopes up. We apologize for the error.